Nuremberg (Embedded World 2019), February 28, 2019 - Macnica Europe GmbH announces the completion of a distribution agreement with Neoway Technology for the European DACH region, United Kingdom and Israel. Neoway Technology Co., Ltd., Neoway for short, is a high-tech company that manufactures communications products and provides total solutions and services for the Industrial Internet of Things (IIoT). With a products range covering 2G, 3G, 4G, NB-IoT, and CAT-M mobile modules and solutions which are widely used in smart metering, vehicle network, mobile payment, shared devices, security, and other industries. 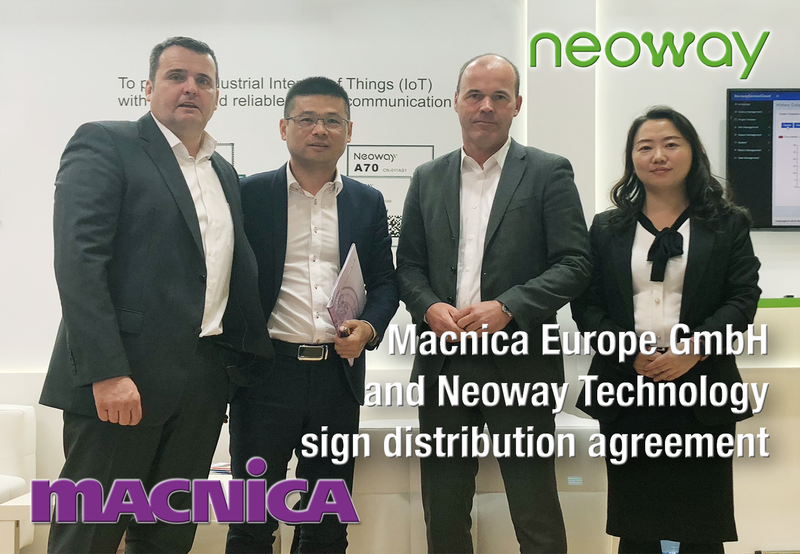 Commenting on the signing of the distribution contract at Embedded World 2019, Andreas Wemmer, Sales Director at Macnica, said: "Neoway's products complete our portfolio of IIoT components with powerful modules for low-power wide-area net-works. We expect stormy market growth in the NB-IoT area in particular over the next few years, because the new wireless technologies and the almost complete geographic coverage, especially for plant monitoring and meter reading outside metropolitan areas, can exploit significant productivity potential with cost-effective products. Whilst WPANs such as WiFi, Bluetooth and ZigBee, etc. need existing local infrastructures, actuator / sensor modules with NB-IoT connectivity can be used virtually anywhere in Europe, providing maintenance-free data over many years thanks to their low power consumption." Jürgen Pöschl, Managing Director at Macnica added, "We do not see Macnica GmbH as a mere distributor but as a technology partner to our customers. With this objective in mind, we identify innovative semiconductor companies to enable product development who, in our opinion are relevant and competitive in the markets of tomorrow. Solutions from home automation to industrial IoT which provide reliable and secure connectivity coupled with efficient use of energy is an essential element. With the modem modules from Neoway we open up the field of licensed wide-area net-works and enable networking independent of the local connectivity situation”. Neoway Technology was founded in 2006 and is headquartered in Shenzhen, China. To provide fast local support, the company has offices in Beijing, Shanghai, Hang-zhou, Nanjing, Fuzhou, Xi'an, Hong Kong, and has agents or distributors in west Europe, USA, Russia, India and Southeast Asia. Neoway has powerful capabilities in communication technology and product development. It is composed of a team of professionals who are experts in RF technology and product reliability. Over 50% of its employees are R&D engineers. Neoway has several world-leading products and technologies and has developed extensive data protection mechanisms. Neoway's products have been certified with various global protocols for their stable and reliable performance. Neoway has also been approved by IATF 16949: 2016 Au-tomotive Quality Management System for the development of automotive products.